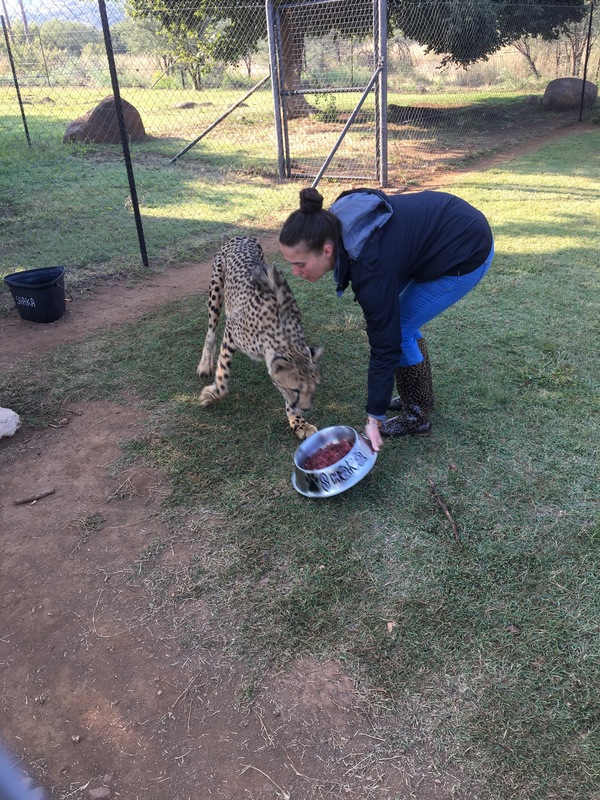 As many may know, my younger sister, Georgia, and her boyfriend, Michael de Souza, manage and run Dell Cheetah Centre – an animal (primarily cheetah and cats) rescue. They take in orphaned animals, and those who aren’t wanted at their original homes. We spent the night down there last week, to see how it all works. We were very privileged to see two different feeding times. 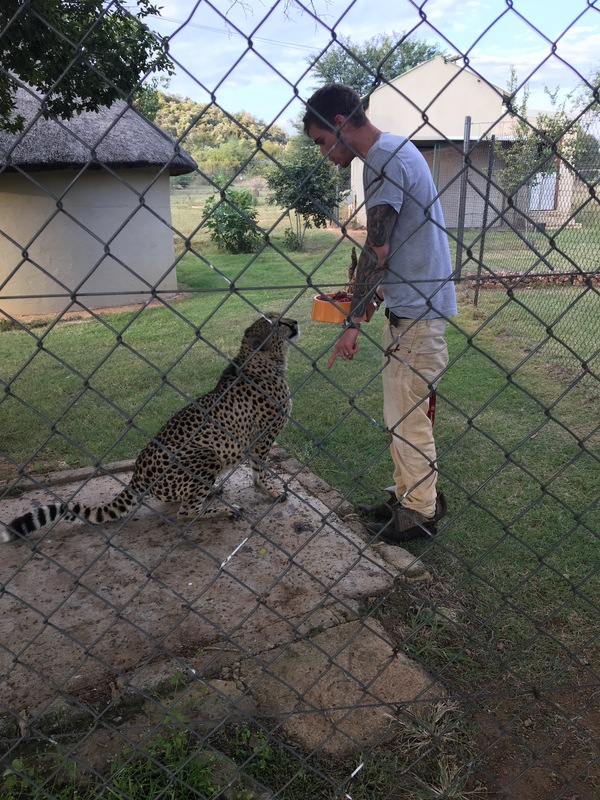 Pete’s favourite part of the whole experience was seeing them prepare the meat (each Cheetah has horse meat as standard, and every now and then they’ll get a *gulp* live bunny to chase – DCC are one of the only places in SA permitted to give live food, due to their release programme). They also feed the smaller predators – including birds – day-old-chicks, pinkies etc). My sister, ever the organised one, arranges them in their bowls like a five star meal. 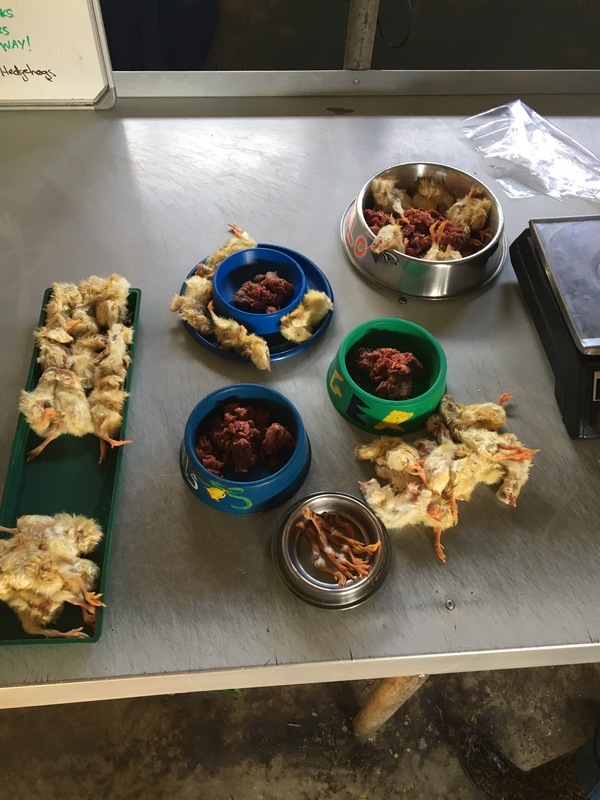 They feed each animal a specific amount of food, perfectly formulated to suit each one. It really is fascinating. Pete joined in and fed Jade, which he loved. DCC has recently stopped all tourists interacting with their animals. For the first time, recently a child was mauled by a cheetah at another centre in South Africa. Whilst cheetahs are one of the smallest of the major ‘big cats,’ they are still powerful creatures and they are, imaginably, very quick. They are wild animals and deserve to be treated as such. 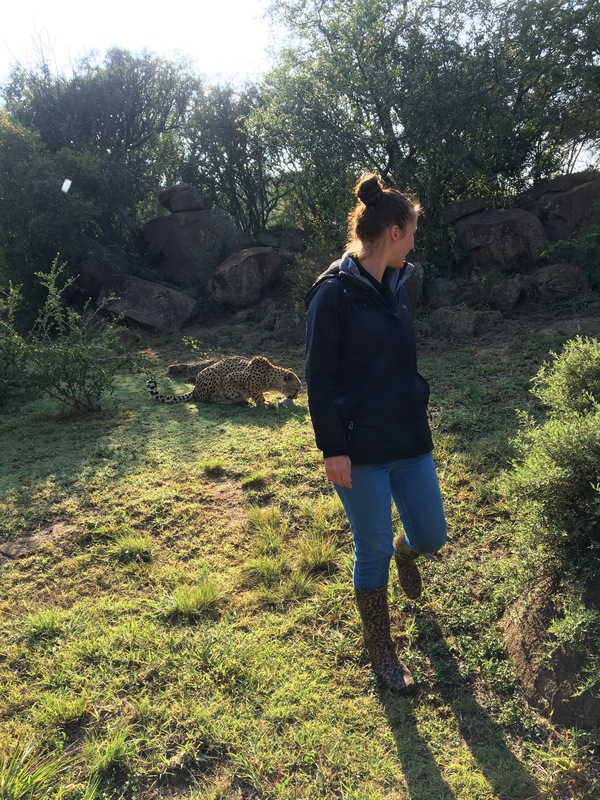 Captive cheetahs have never before been released into the wild (for various reasons, such as becoming too reliant on humans) – it has been attempted but never succeeded – but, with the correct protocol, Dell Cheetah Centre is fully aiming on becoming the first to fully release cheetahs. We thoroughly enjoyed our trip to DCC and did not want to leave. One night wasn’t enough, and next time we’ll be staying longer! 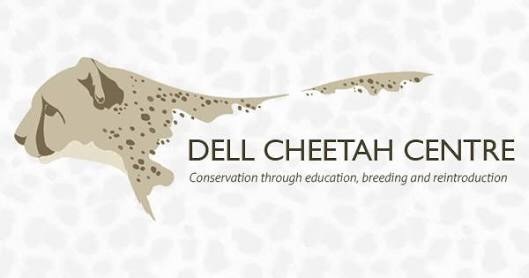 Dell Cheetah offers a volunteer programme, for both local South Africans and international citizens. For R10000 (about £575, current exchange rate) volunteers will assist with meal preparation, maintence of enclosures, creating enrichment for the animals, observing the animals, feeding the animals and cleaning enclosures, plus the added option of a trip to the Kruger National Park (South Africa’s primary game reserve, the size of Wales and home to the Big Five, the Little Five, and more). The minimum stay is 2 weeks. 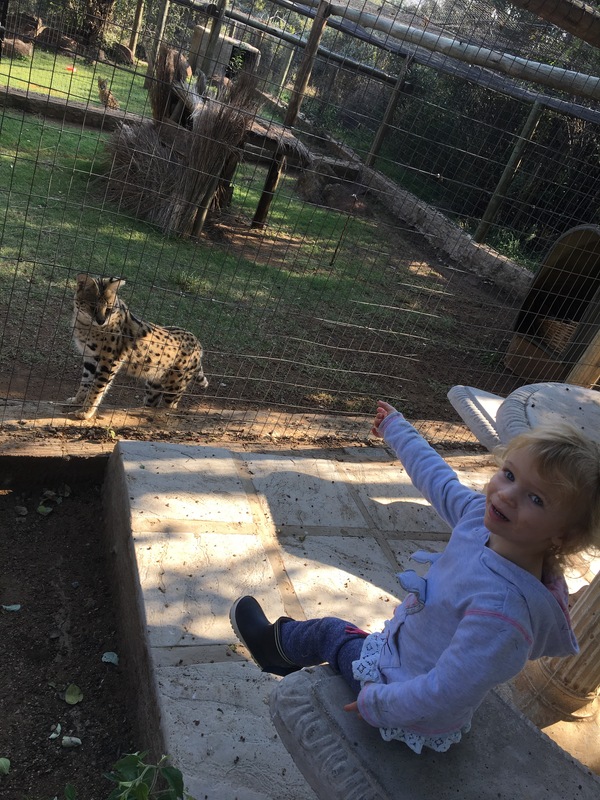 Dell Cheetah Centre is located on Farm Vaal Rock, near Parys, Free State, South Africa, and is just over an hour’s drive from OR Tambo international airport (5 daily flights to and from London, and daily flights to and from Europe and the US).